Wacey Finkbeiner is making his Global Cup debut this June. Photo: Covy Moore/CovyMoore.com. PUEBLO, Colo. – Like many Canadians, Wacey Finkbeiner struggled last season with the decision to compete at the qualifier for the inaugural Global Cup or attend the Canadian Finals Rodeo (CFR). Both events were taking place in Edmonton, Alberta, on the same dates, and Finkbeiner ultimately decided to skip the first Global Cup event. “That was pretty hard to miss,” the Ponoka, Alberta-native said. “Like I was for damn sure cheering for those guys, but it’s different when we’re at two different arenas and two different crowds. And when the roster of those set to represent the Maple Leaf at the next installment of the Global Cup in Sydney, Australia was released, he was disappointed to not see his name. “I was pretty disappointed,” Finkbeiner said. “Well, my own showing at the PBR [Canada] Finals last year, I had a weak finals, and then made CFR, so I wasn’t real surprised I wasn’t on the team to begin with, but I was pretty disappointed in myself not being on it to begin with. Finkbeiner will now have the opportunity to ride for his home nation after all. Team Canada head coach Aaron Roy named Finkbeiner to the team this week following the news that Jordan Hansen will be sidelined the next several months with a broken vertebrae and hip. “When you get the Canada flag on your back and you’re in a different country, and all of your buddies are there, I think it’s going to be badass,” Finkbeiner said. After concluding the 2017 season ranked No. 33 in the PBR Canada national standings, capped by a 0-for-2 effort in Saskatoon, Saskatchewan for the Finals, Finkbeiner has been electric in 2018. 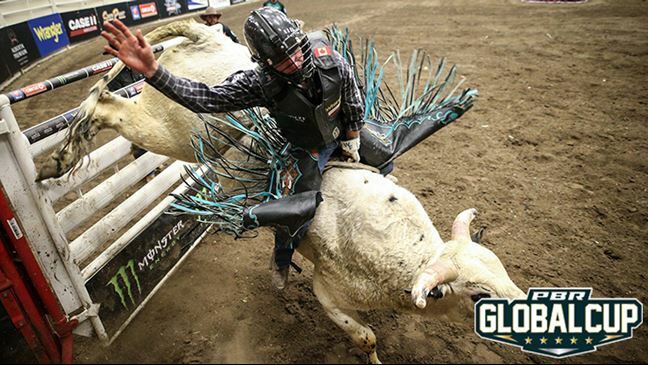 Riding at six Canadian Touring Pro Division and Monster Energy Tour events, the 25-year-old has recorded five Top-10 efforts, highlighted by a second-place finish in early May in Prince Albert, Saskatchewan. “It’s going to be probably a little bit more added pressure because it’s your entire country. Finkbeiner will be joined in Sydney by fellow Team Canada riders Dakota Buttar, Tanner Byrne, Brock Radford, Zane Lambert, Lonnie West, Jared Parsonage and Justin Lloyd for the event on June 9-10 at Qudos Bank Arena. And while he was excited to receive the opportunity to compete on Team Canada, the call came with added significance as the message was coming from arguably one of the most accomplished bull riders in Canadian history – Roy. “Well with the career he’s had and what he’s done for Team Canada over the years back when they used to have it all the time, the stuff he’s done for Canada as far as Canadian bull riders is pretty big, so to get the call from him, that was pretty cool,” Finkbeiner said. Prior to making the near 12-hour flight to Australia, Finkbeiner plans to compete at the Canadian Touring Pro Division stop in Swift Current, Saskatchewan, and Monster Energy Tour event in Moncton, New Brunswick, with his schedule after to be decided.